Chase Beanie is rated 4.6 out of 5 by 13. Rated 5 out of 5 by angelarrow from Had to buy another! I have had a black chase beanie for years. My hubby adopted it, so I thought I'd buy another for myself. My hubby is ALWAYS cold, and his chase beanie is often enough, even on really cold Alberta winter days. We also like the fact that it's lightweight enough that we can stuff it in a pocket, backpack, purse, or for a holiday and it doesn't take up much room! I think it could even fit under a motorcycle or bicycle helmet. I'm extremely happy with the one I just bought. I have a fairly large head for a small 5' 2" female, and it goes over my ears. So you could say if fits large, but the fact that it's light and covers the ears is perfect, in our opinion! Buy it! You won't be disappointed! Rated 4 out of 5 by DougMcW from Go to pocket beanie This is my go to pocket beanie. As a guy with a shaved head, a beanie is a necessity. I own two of these and wear them all the time. As a running beanie this is the perfect blend of weight and breathability. Once it's on you don't notice it for the rest of the run. For day to day, this is a solid beanie to take the edge off the cold. When it's really cold though, you're going to want a warmer hat. Rated 2 out of 5 by curmudg from nice beanie - fits small. needs to be a bit deeper so it covers the ears, if necessary. Rated 5 out of 5 by NatureBoy from Surprisingly thin, surprisingly useful. Thinner and 1/2" longer over the ears than the Pocket Hat, the Chase Beanie is a fabulous option under a wide brim hat to cover your ears, and under bike, climbing and work helmets. Slightly more "fashionable" than, and rolls up marginally better than, the PH. Shoulder Season Superstar. Rated 5 out of 5 by Cynthia from Chase Beanie Bought one for my husband for Christmas and he liked it so much that he got another one. Very comfortable and soft. Doesn't give you that itchy feeling on you forehead. Would recommend this product. 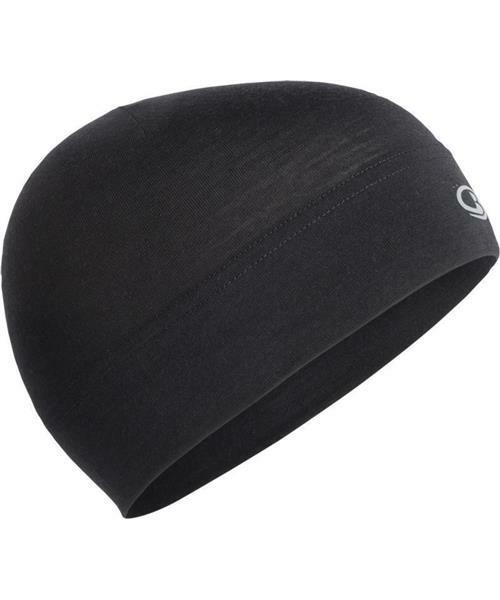 Rated 5 out of 5 by scottevil from Perfect everyday and athletic beanie Fits nicely under my bike helmet, keeps the head warm when it's cold and breaths as well so I don't overheat or get sweaty when on the move. Rated 4 out of 5 by RamaLama from Mogul Beanie? For people with larger heads like me this hat would not fit. Unfortunately no information on the alternative suggested (the Mogul Beanie) could be found on the website. p.s. Congratulations on your wonderful products and way of doing business. Rated 5 out of 5 by Justsomeguy2 from Everyday use For me, this hat is an everyday hat. I have a few of these hats and have worn them while camping (regulating my heat on summer nights in Algonquin Park), going to work daily in the winter, and spending the day outside comfortably in weather of -5 degrees Celsius. For a day outside of lower temperatures I'd recommend one of the warmer hats from the Icebreaker line (something I also have).